Hydropruf 100 is a specially formulated anti-crack, integral, general waterproofing admixture which reduces the transmission of water through concrete, mortar and screed. It is suitable for use in all concrete, mortar or screed. Typical applications areas include, wall plasters, Foundation, piles, water retaining structures, manholes, sewage treatment plants, swimming pool, and septic tanks. SKU: SW102. Availability: In Stock Size: N/A Category: GENERAL WATERPROOFING. Tags: anti crack for screed, anti-crack waterproofing, waterproofing admixture, waterproofing admixture for mortar. Reduces the permeability of the concrete, plaster and screed, thereby increasing building durability. Unlike coatings, HYDROPRUF 100 when added to plaster or concrete during mixing becomes an integral part of the concrete and plaster; hence, waterproofing protection is still maintained even if surface damage occurs. Helps to reduce shrinkage crack development in concrete and Plaster especially in hot weather. As a complimentary protection in the Screeding of terraces, Balconies and Roof Gutters. All concrete, Mortar and Screed requiring waterproofing. 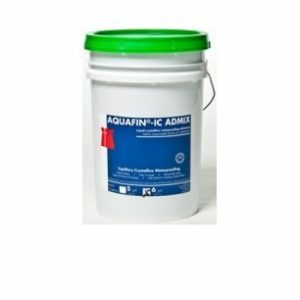 AQUAFIN-IC ADMIX is a state-of-the crystalline waterproofing admixture available in liquid and powder form. The chemistry within the AQUAFIN-IC ADMIX reacts with moisture, silicate and free lime in the concrete, creating millions of insoluble crystalline fibers, which fill the pores, capillary tracts and minor shrinkage cracks within the concrete. Passage of water through the concrete, either from the positive or negative water pressure side is permanently blocked and the reinforcement protected from corrosion. AQUAFIN-IC ADMIX can be added to the concrete mix at the time of batching or at the job site to a ready mix truck with full mixing capabilities. HYDROPRUF WP300 is a specially formulated Liquid anti-crack, integral, general waterproofing admixture which reduces the transmission of water through concrete, mortar and screed. It is suitable for use in all concrete, mortar or screed. Typical applications areas include, wall plasters, Foundation, piles, water retaining structures, manholes, sewage treatment plants, swimming pool, and septic tanks.